The fruits of Gyrocarpus americanus (Hernandiaceae) hang in clusters awaiting take off. . . and clearance from air traffic control. 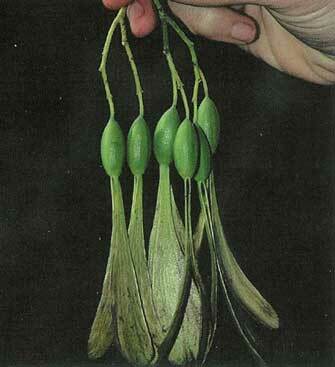 The winged seed of Alsomitra macrocarpa is one of the largest winged seeds in the Plant Kingdom. Every now and then, field botanists are treated to transcendental moments when the light is golden, the air is fresh, interesting plants are at hand, and the hardships of field work just melt away. During those times, scientific insights arrive with astonishing clarity and grace. One such moment for me came on a sunny afternoon in the Kebun Raya Botanic Garden, in Bogor, Indonesia, some years ago. On that memorable day, I was transfixed as I watched dozens of winged seeds of Alsomitra macrocarpa (Cucurbitaceae, the squash family) glide to the ground in broad, lazy spirals. The seeds spilled out from a fruit hanging on the liana climbing on one of the enormous old trees in the garden. All the principles of aerodynamics as they relate to seed dispersal were manifest in that one lovely moment. The gliding seeds of Alsomitra exhibit two kinds of motion: The forward gliding motion, which takes the seed on a helical, downward path, and phugoid oscillations, in which the gliding seed gains lift, stalls, drops briefly until it accelerates enough to generate lift, starting the process over again. Phugoid oscillations are well known to aviation engineers and model airplane fliers, because they can destabilize mechanized flight, but in the seeds of Alsomitra, phugoid oscillations add a graceful rhythm to the descent, and more importantly, slow the descent of the seeds giving them more time aloft. Time aloft is the sine qua non of successful dispersal by wind. 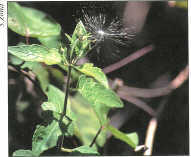 Seed dispersal is an essential part of any plant's life cycle. Plants must colonize new areas to escape the competition and smothering shade of the mother plant. Also, many habitats are short-lived or unstable — light gaps in the rainforest, for example — so plants adapted to those habitats must always find new ones in order for their offspring to survive. Plants disperse their seeds (or fruits with the seeds inside) in a variety of ways. Bats, birds, monkeys and other animals that eat fruits and transport the seeds are one way. Other plants rely on burs and hooks that catch on passing animals. If you have ever pulled a sandbur (Cenchrus sp.) from your sock (or toe), you know how effective that method of dispersal is. But many plants don't need animals to disperse their seeds; they rely on the wind. Seeds and fruits go wherever the wind takes them, yet despite that inherent uncertainty, wind-dispersed plants have been quite successful in colonizing large areas of the world. The fruits of Triplaris (Polygonaceae) have three wings and spin as they drift to the ground. There are three kinds of wind-dispersed seeds and fruits, three strategies to ride the wind currents and, with luck, find a new home. All three strategies have been shaped by evolution to maximize time aloft. The longer a seed can stay in the air, the farther it can fly. That fundamental relationship between time aloft and dispersal distance is the overriding selective force in the evolution of wind-dispersed seeds and fruits. The first strategy is to employ a wing of the sort I saw on the seeds of Alsomitra in Bogor. Wings can be very effective at airlifting seeds and fruits. Wings are found on the seeds of Tabebuia and Casuarina and on the fruits of Gyrocarpus and Triplaris. (If you ever see me in Plot 142 throwing the helicopter fruits of Triplaris into the air and watching them spin to the ground, please be assured that I am doing science.) The wing increases drag by catching the wind and slowing descent. Evolution has refilled these structures so that seed weight and wing surface are in aerodynamic balance. In a few seeds and fruits, wings can generate lift as well, maintaining the seed aloft. Lift and drag work in concert to slow the descent of the seed and give it a longer flight. The seed of a milkweed temporarily lodges on a leaf as it awaits another gust of wind to catch its silky parachute and send it on its way. The second kind of wind-dispersal mechanism is the parachute or plume. A familiar example of a northern plant that employs this sort of dispersal structure is the dreaded dandelion (Taraxacum spp. ), a member of the sunflower family (Asteraceae), whose members are almost always parachutists. Examples of tropical species with parachutes are the seeds of milkweeds (Asclepias and their kin) and our native Tillandsia bromeliads. These plants have fruits that split open when ripe, releasing seeds equipped with tufts of air-catching hairs. The kapok trees (Ceiba spp.) and willows (Salix spp.) are two more examples. Their fruits open to release bits of fluff in which their seeds are embedded. The cottony mass slows the descent and allows the seeds to drift on the wind currents, proving that The Wind in the Willows is not just a memorable children's book, but a way of life. The parachutes and cottony fluff do not generate lift, but they do increase drag very effectively. The third strategy for wind dispersal does away with drag and lift entirely. Instead, evolution has fashioned seeds so small and so light that the fluid movements of air can substantially overcome the force of gravity. These are the dust seeds; an example of a plant group known for dust seeds is that tropical family par excellence, the orchid family. Orchid seeds are the smallest seeds in the Plant Kingdom, but orchids compensate for the small size of their seeds by producing thousands of seeds in every pod. The seeds are little more than specks of dust and, like dust, they can remain aloft for hours at a time. The best testimony to the effectiveness of dust seeds are the orchids that grow on islands. The Galapagos Islands, 600 miles from the South American mainland, have five indigenous orchids. The Falkland Islands, 300 miles from Patagonia, have four. Hawaii, thousands of miles from any continent, has only three indigenous orchids. Orchids arrived on these islands by riding the wind currents. Wind dispersal may not be the most efficient way of getting around - untold millions of seeds must fall into the oceans - but given enough time, orchids can colonize just about anywhere. It is no mere coincidence that the two most species-rich plant families - the orchids (Orchidaceae) and the sunflowers (Asteraceae), each with about 20,000 species — are mostly wind-dispersed. Their ability to maximize time aloft must surely have allowed them to colonize distant lands and fill new niches. Effective dispersal allowed new populations, isolated from their source populations, to diverge genetically over time. How did so many species evolve? The answer is blowing in the wind.